Itaparica is an island surrounded by a landscape of fishermen in saveiros, canoes, and sailboats, where its inhabitants have a queen: Iemanjá, the lady of the waters, a siren with five names and a powerful orixá of the Candomblé. This is an island whose landscapes are associated with the literature of Jorge Amado, the lyrics of Dorival Caymmi, and the images of Pierre Verger. Located across from Salvador in All Saints Bay, the center of the biggest coastal gates of the state of Bahia in Brazil, the island of Itaparica is closely connected to the cycles of the sea. Its population’s relationship to the water is absolute hosted by a unique natural setting where the coastal landscape changes daily with the lunar cycles of the tides. 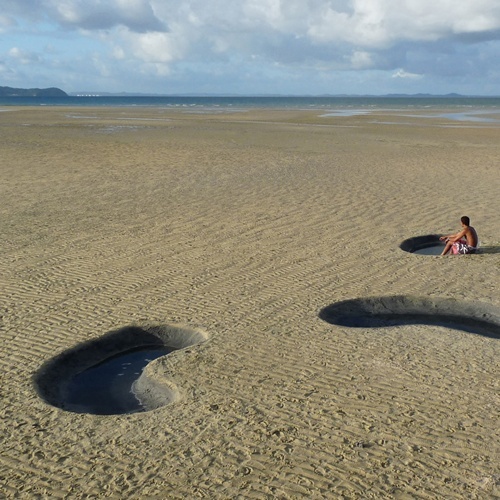 The site-specific intervention Baixa-mar, sea mirrors, consists of creating a dialogue with nature generated through the cyclical transformation of the sea. A series of ponds are excavated on the dunes during the low tide to propose personal spaces, or small oases, for contemplating the view of the landscape that the island provides from the coast: the horizon of the bay, the profiles of the Maré and Frades islands, and the profile of the city of Salvador. But above all, they allow the observation of the natural daily spectacle offered by the sea through the movement of the tides. At sunset, when the tide rises, the dunes and their ponds disappear into the sea; the next day, it is possible to rediscover these small oases with the low tide, this time as mirrors to the sky.